A team of biologists used ancient DNA to finally find this mysterious mammal a home on the evolutionary tree. 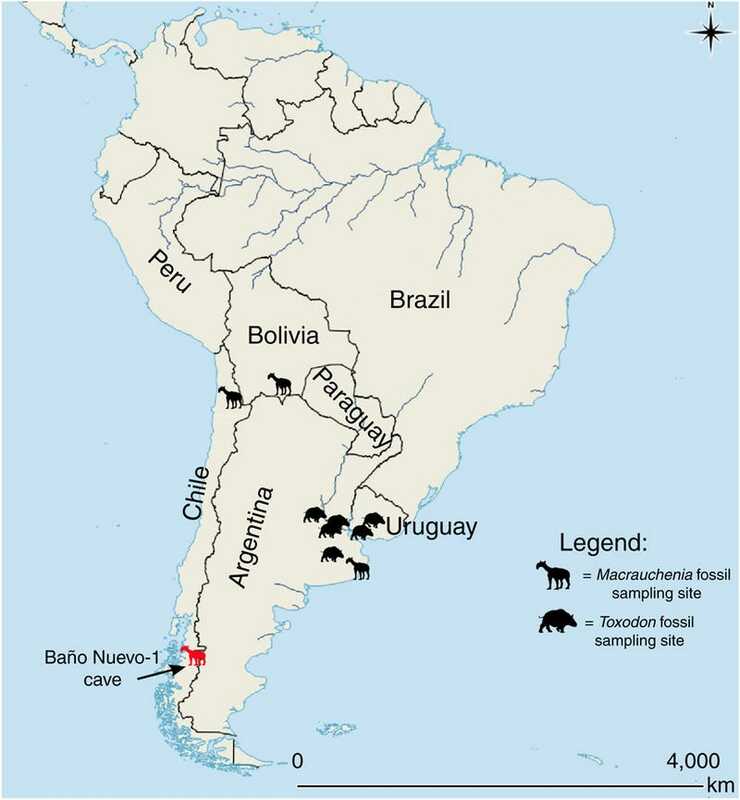 The species, called the Macrauchenia patachonica, that went extinct around 10,000 years ago and was found in South America, is genetically closest to the order containing the odd-toed ungulates that includes tapirs, rhinos and horses. But finding the relationship wasn’t easy, given the old, short segments of DNA. Scientists have been aware of these fossil animals in South America since the 1830s, but the confusing combination of body part shapes have made placing them on the evolutionary tree pretty much impossible. 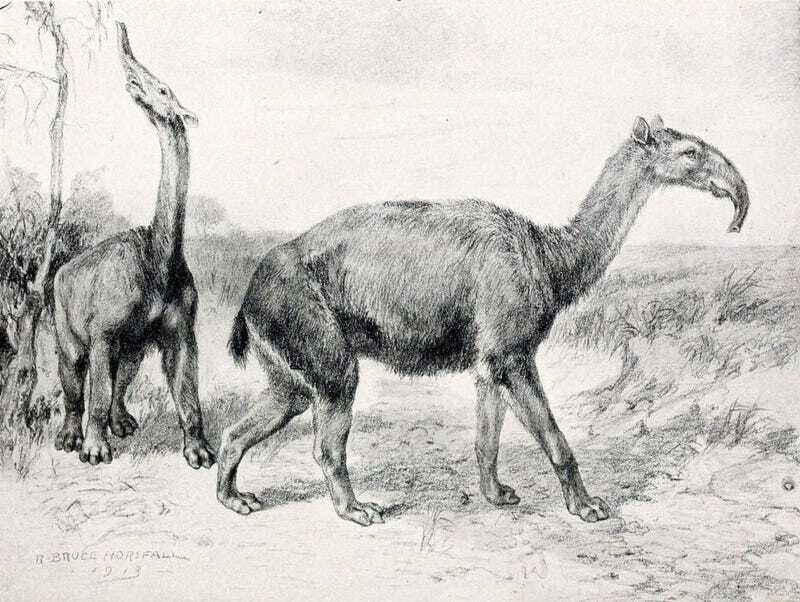 All that famous biologist Richard Owens could gather from M. patrachonica was that it was an “ungulate,” which basically means he knew it was a hoofed mammal. That’s sort of like looking at a T. rex fossil and only being able to figure out that it’s a dinosaur. Since then, another team used ancient proteins to understand the animal, but now scientists have actually been able to confirm the relationship using DNA evidence. The first challenge was simply finding the DNA. The stuff typically degrades off of bones not trapped under permafrost, like those in warm areas. Biologists gathered M. patachonica fossils from several museums around the world, and were able to find and sequence a modicum of mitochondrial DNA (your cells also have DNA in their mitochondria, as well as in their nuclei) on the bones to compare with existing species. The team then mapped what they had via a fairly new approach, using statistics to put together a sort of most-likely mitochondrial DNA sequence, before comparing the fragments to other animals, like horses and rhinos. I told Hofreiter it sounded like trying to piece together a copy of Chaucer’s 14th century Middle English book, The Canterbury Tales without having read it, given only a pile of sentences fragments and some modern literature. He laughed, but I think he also agreed. They published the analysis today in the journal Nature Communications. Researcher Ross MacPhee, mammal curator at the American Museum of Natural History in New York, pointed out that he’d definitely like to do this kind of analysis with nuclear DNA next (nuclear DNA has way more information). But there are simply a lot more copies of mitochondrial DNA in the cell (versus only one copy of the nuclear DNA), making it easier to find samples. And Hofreiter did tell Gizmodo that there are a lot of places where an analysis like this can be led astray by contamination, from either humans or even domestic animals. He was very confident in these results, though. Even with only mitochondrial DNA, this analysis was an important step forward. “A big thing to underline is there have been vast improvements in what people have been able to do with ancient DNA because of improvements to instrumentation and software,” he said. Plus, he was incredibly excited about the outcome of the identification. The species probably split off from the order that became horses, rhinos and tapirs around 66 million years ago, give or take 10 million years. That would make this the earliest split anyone’s been able to identify using this new technique. As far as the animal itself, MacPhee pointed out that, while extinct, M. patachonica wasn’t wimpy. The animal stuck around for millions of years and populated South America before declining for unknown reasons. These specific fossils are all relatively recent, from tens of thousands of years ago.